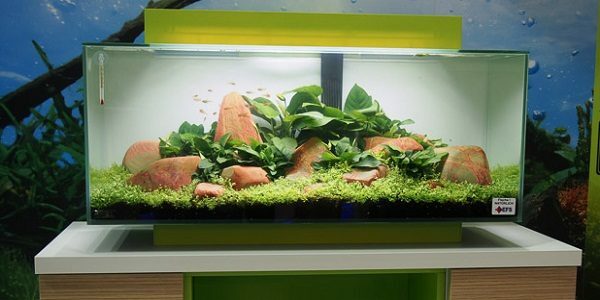 Fluval aquariums are a popular type of aquarium that combines minimalism with functionality. First developed by Hagen Pet Products, the Fluval brand is committed to providing technically advanced, durable, creative, and beautiful aquariums. The first canister filter was developed by Hagen companies in 1982 and is one of the main components of their design. Today, the Fluval Edge, along with many other unique products,is the core offering of the Fluval brand. While there are numerous benefits to using these aquariums, there are also some limitations and other dependencies you should be aware of before making the decision to purchase. The Fluval Edge aquarium comes in both 6-gallon and 12-gallon sizes. The 6-gallon tanks are a rectangular shape while the 12-gallon tanks have greater height. In addition, Fluval recently released a larger design that holds up to 19 gallons of freshwater. However, the defining characteristics of the Fluval design are its modern appearance coupled with functionality. Using contemporary styled stands and LED lights, the Fluval Aquarium creates a unique and memorable appearance. Beyond aesthetics, the Fluval Aquarium also includes their acclaimed filtration system to help maintain a healthy and thriving aquarium environment. Unlike many aquariums, the filtration system is an internal component that is sold with the glass casing, taking away the stress and challenge of selecting your own filtration system. However, the modern appeal and great practicality of the Fluval Aquarium makes it difficult to justify the high price tag, which ranges from $150-250 depending on the size. The Fluval Aquarium has many alluring aspects to its product offering. The Hagen Company is committed to providing outstanding technology to support your aquarium endeavors, which is clearly evidenced by the practicality and aesthetic of the Fluval Aquarium. The contemporary style of the Fluval Edge is its most recognizable characteristic. By creating such a beautiful and elegant appearance, it’s difficult to pass up the opportunity to purchase. Every aspect of your aquarium is clearly portrayed in the Fluval Aquarium, down to the finest detail; your aquarium will be elegantly portrayed in the framework of this aquarium. Even from the top view, you are able to clearly see and enjoy your aquascape. Beyond the design, the assembly of this aquarium is also remarkably simple. As the filtration system is sold with the casing, setting up the Fluval Aquarium is incredibly simple and easy. As a result of this low barrier to entry, the Fluval Aquarium also appears to many beginner aquarists who may not wish to put forth the effort of setting up and selecting their own equipment. Finally, the aquarium is also fairly easy to support due to the provided filtration system. Using a few small accessories like algae or a siphon, you’ll be able to easily maintain the aquarium and enjoy it as the aesthetic you imagined it to be in your home. Despite the benefits in maintenance, design and practicality, the Fluval Aquarium does have some disadvantages. For example, the size of the tank should discourage you from using larger fish or more dynamic plant life in your aquascape. If you select fish that will grow too large or if you have plants that will rapidly cultivate, you’ll be creating extra maintenance for yourself trying to support so much life in a small space. In addition, the price tag on Fluval Aquariums can also be viewed as a negative aspect for those just starting out in the aquaria hobby. The Fluval Edge Aquarium is only one of the many product offerings by Hagen Company. From filtration systems, lighting, heating, and water pumps, the Fluval product line will support your aquarium hobby through many different means. Even beyond freshwater, the Fluval brand offers support in saltwater aquariums as well, providing a similar product line in filtration, pumps and other water care. The Hagen Company has been in business for over 30 years and their commitment to providing leading technology and support for pet care is clearly evidenced by their comprehensive product lines in many aquarium mediums. The overall style and design of the Fluval Aquarium is truly unique and beautiful. Coupled with the high functionality and accessibility of the product, the Fluval Aquarium is a great first choice when implementing your initial aquascape. The ease in maintenance and set up is perfect for the beginner aquarist trying to createadistinctive and attractive design. Despite the large price tag, the benefits in the appearance and functionality make this a great option for many aquascapers.